Everybody who comes to Playitas Resort should meet Mr. Murdo McCorquodale or just Murdo. Considered a gentleman by all his colleagues, Murdo shows us his human side and talks about his life. Hi Murdo! Where do you come from? When did you start to play golf? My father was a golf professional and like a Swiss child learns to ski as soon as they can walk and maybe a Spaniard starts to play football, a Scottish kid has a golf club in the hand and plays Golf. Why did you finish up in Fuerteventura? Ha, ha, ha… that’s a long story! My wife is from Ibi, near Alicante. It was not easy to get a job in Spain. Basically in order to get a job in Spain, you need german more than spanish in my business, in the Golf world. First thing we did was we moved to Germany to learn the language and we stayed there for a couple of years and then I was offerer a job in Portugal which we thought, well… it’s “almost” Spain (laughs) so we moved to Portugal, we stayed in the Algarve which is a really nice place to live for a couple of years but it was not an easy place to work – economically- there are a lot of poor people and a lot of multimillionaires but nobody really in the middle and it was quite a difficult time as a self employed Golf professional to find enough work. From there I was offered a job in Egypt which was actually two fantastic years. It was a great place to live with very service minded people and a great place to work but when Ana became pregnant we decided we wanted to eventually move to Spain. 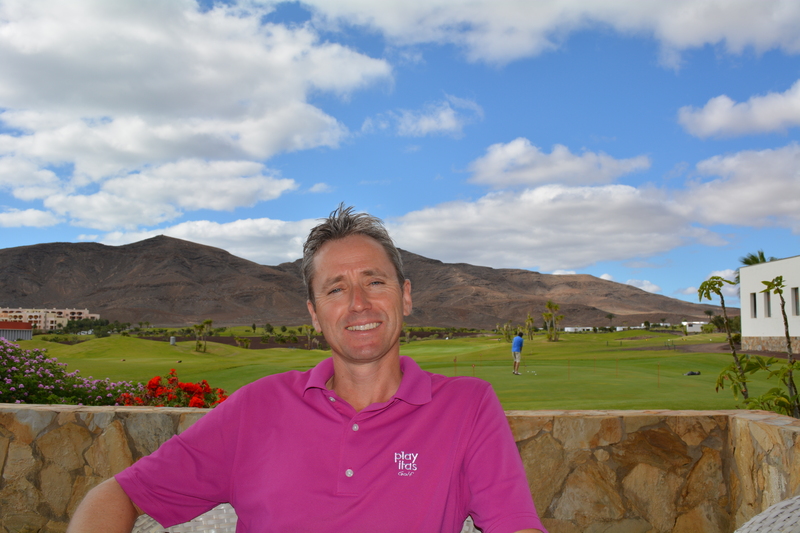 Playitas Resort got in touch with me and offered me the post of Head Pro mainly because as a PGA pro with the ability to speak English, Spanish and German it was ideal for the resort. I fell in love with Playitas Golf course because of it’s potential and it’s beautiful views on every hole with no surrounding houses and no kids screaming… It’s something different which I still really love. Who’s your favorite Golf player? I did love Severiano Ballesteros but unfortunately he died two years ago, he was every golfer’s hero. I don’t have any particular favourites (unless I have a bet on them) but I do always have a big interest in European Ryder Cup player Paul Lawrie as I used to work with him in Scotland and he is a friend, Jose Maria Olazábal is another golfer who is a real gentleman on and off the course. Definitely! The Spaniards play Golf with a lot of passion and flare and they play a different style of game actually. They all have fantastic short games. What can you tell about the Playitas Golf Course? Playitas Golf is very different. It’s not your normal new Golf course because when new Golf courses are built, they are basically all the same. There are 4 par 5’s, 4 par 3’s and 10 par 4’s, it’s the standard . That is par 72. Playitas is short but very quirky. It’s more like what I’m used to playing in Scotland. It’s a par 67, it is short but that doesn’t mean it is an easy course, it is very tricky, especially when the wind blows. Anyone can birdie a par 5 but it’s much harder to birdie a par 3, it is a good test for all levels of golfer. The Scottish designer has used the natural slopes and features to create a very links like golf course. Links basically is a description of the British style seaside courses which are always firm and depending on the wind direction on each day can vary considerably. I do. To be honest I like cycling, I like windsurfing, I like diving and football but I am Scottish so I’m not very good at football. I prefer to watch Glasgow Rangers. Did you play as a professional golfer? Woods’ standard and I knew that but I still play Pro level and compete on a National level when I can. I have a family, I have a wife and two children and being a good dad and husband is the most important thing for me. I also have always loved to teach people which I seem to be more talented at. If you didn’t play Golf, what would you do? I’d be a singer. I love singing. It’s my biggest passion. I love swing and jazz music. I have a big passion for this. One day I see myself having a swing bar, not a swingers bar (before you say anything), a cool place with a piano, good live music, cocktails, maybe some healthy food and in a big city. The weather is unbelievable. Summer is not too hot and we have great conditions in the winter. The Golf course is always in good condition and we have the Hotels next door to the course. 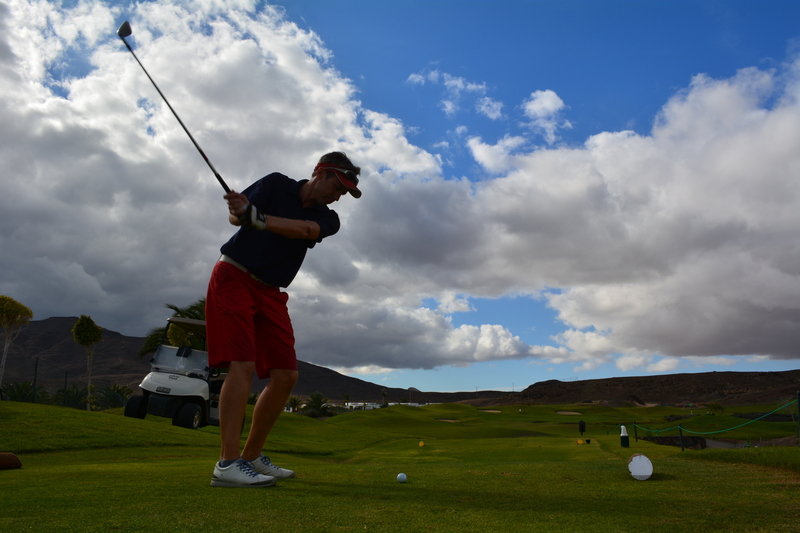 The Beach is close by and we have the best sports facilities to combine with Golf. There are many good Restaurants and the island has two other Golf courses to play which compliment Playitas golf very well. It’s pretty much “heaven on earth”. It’s a very relaxed sports resort with a Golf course and I like the type of golfer that plays here – not too serious and always patient with less experienced players. 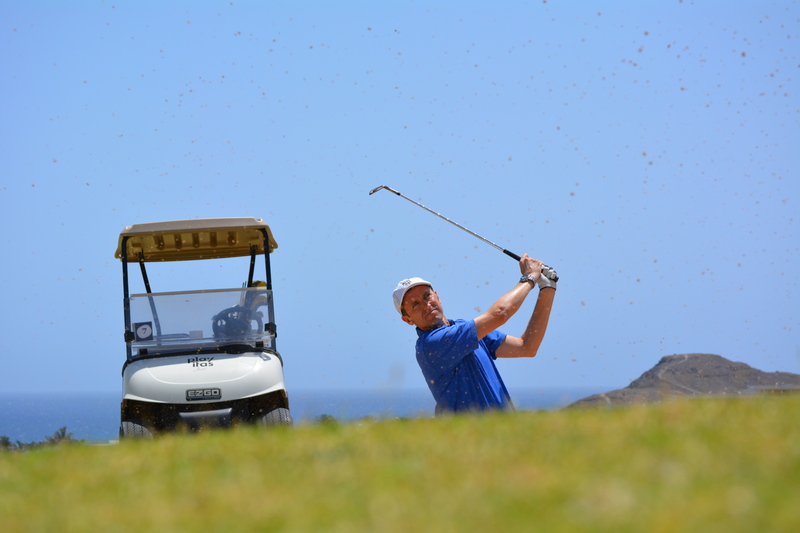 This entry was posted in Fuerteventura, Golf, Sports - Deportes and tagged Birdie, Bogey, Canarias, Canary Islands, deporte, Deportes, Eagle, Fuerteventura, Golf, Golf Pro, Hole, Islas Canarias, Murdo, Murdo McCorquodale, Par, Paul Lawrie, playitas, playitas resort, Professional, sport, Sports. Bookmark the permalink. ← What about an adventure?